Successful prosecution of fly-tippers in Northumberland should be publicised more in order to discourage others. That was the view of councillors on the county council’s community and claces committee as it heard a report into the problem in Northumberland. Fly-tipping has increased year-on-year across England since 2012 as councils increasingly cut waste management services to save money. 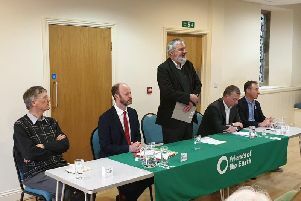 But a report to the committee by Paul Johnston, executive director of place, revealed that cuts in hours at the five least-used tips in the county had not resulted in a surge of fly-tipping. And the county council also successfully prosecuted more fly tippers than most other local authorities in England – a legal action for every 2.1 incidents in England but 1.5 in Northumberland.. In 2017-18 more than 1,000 incidents were dealt with in Northumberland resulting in nine fly tipping prosecutions, two vehicles seized and crushed, five formal cautions, nine fly tipping fixed penalty notice fines, 28 statutory notices and 213 warning letters. The successful prosecutions included a Cramlington man who committed six fly-tipping offences county wide – all Transit-van size. His Transit van was also seized and crushed. Councillors commented on the report that publicising successes should be a key target in order to deter others from fly-tipping. Meanwhile, statistical evidence reveals fly-tipping in the county dipped rather than surged when the least-used waste management centres had their opening days reduced from seven days a week to four in October 2016. The cuts at the centres in Allendale, North Sunderland, Wooler, Haltwhistle and Kirkley West Thorn resulted in a £150,000 per year cost saving for the council. Mr Johnson said: “The evidence available suggests the concerns raised that the change to the opening days would lead to widespread fly tipping have not been realised.